After contending that Amanpour attempted to "understand" violent Muslim fundamentalists without trying to "understand" evangelical Christians and Israelis, Abrams played a clip of Amanpour in which she "blames the warrior Jews" for the anger of radical Muslims. Amanpour: "Muslims, like people everywhere, abhor terrorism. The small minority who resorts to violence is symptomatic of something many of us have failed to understand: the impact of God's Jewish warriors goes far beyond these rocky hills. The Jewish settlements have inflamed much of the Muslim world." Abrams soon brought aboard Muslim author Asma Hasan, Air America host Reverend Wilton Gaddy, and terrorism analyst Steve Emerson for a discussion of the topic, during which Emerson labeled the CNN series as "the most unfair series" and "the most dishonest series on television that I've seen in my 20 years of reporting or covering terrorism." Emerson further criticized Amanpour for not showing examples of violent Muslim extremists in Europe such as the Madrid and London bombings, and for portraying Jews and Christians as "demons." Emerson: "I thought that, in part, the actual dogma of this series actually focused mainly on Jews and Christians as being the demons, and in fact, one could accuse her of actually engaging in anti-Christian and anti-Semitic behavior by the selection of facts she chose to choose." Abrams showed a clip of Amanpour speaking to Christian youth leader Ron Luce of Teen Mania Ministries during which she contended that campus rules prohibiting female students from wearing short skirts and prohibiting male students from using the Internet without supervision reminded her of "totalitarian regimes," and compared the female dress code to what the Taliban did. Amanpour: "But that's what the Taliban said. They kept women in their house because men couldn't be trusted around them." 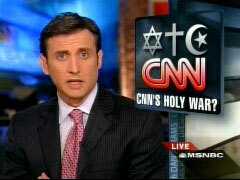 DAN ABRAMS: For the past week, CNN has been proudly promoting and then celebrating its series called God's Warriors, presumably a look at radicals of different religions willing to fight for their cause. My take: I think it's fair to say it was not what it claimed or promised to be. ABRAMS: Oh, yes they did. CNN should have called it what it was: a defense of Islamic fundamentalism and the worst type of moral relativism. For each of three nights, CNN devoted two hours to the, quote, "warriors" of each religion: Jewish, Christian and Muslim. But rather than distinguish between Islamic terrorists who utilize fierce violence to achieve warped goals, and the merely fiercely religious or even just those who fiercely believe in the state of Israel, Christiane Amanpour avoided getting bogged down in objectivity. Christians and Jews, for example, who support Israel's strategy for self-defense are just as much God's warriors, according to Amanpour, as the Islamic radicals who blow themselves and others up in an effort to destroy the world as we know it. A handful of the most radical of the Jews and Christians who can almost all be identified by name are highlighted. The violent Islamic fundamentalists are, quote, "understood," with no comparable effort to "understand" the evangelical Christians or Israelis. Amanpour even offers an explanation for the angry radical Islamists. She blames the warrior Jews. AMANPOUR: Muslims, like people everywhere, abhor terrorism. The small minority who resorts to violence is symptomatic of something many of us have failed to understand: the impact of God's Jewish warriors goes far beyond these rocky hills. The Jewish settlements have inflamed much of the Muslim world. ABRAMS: She takes Jewish and Christian political movements, even Jewish lobbyists in Congress, and lumps them in with God's warriors, thereby equating them with the radical Muslim warriors, the quote, "much feared and little understood." Maybe most troubling, much of the warrior Muslim program highlights not the warriors themselves, but claims of discrimination against Muslims. AMANPOUR: Geneive Abdo is the author of Mecca and Main Street. She says that since 9/11, the majority of American Muslims feel they're singled out for suspicion and surveillance by the government and by ordinary people. Imam Fawaz Jneid, leader of a mosque in the Hague, believes Muslims are under attack, victims of religious discrimination. ABRAMS: What does that have to do with the warriors? She portrays Muslims as victims, while accusing evangelical Christians of playing the victim. AMANPOUR: The religious right would have you believe that there's no mention of God anywhere in our public sphere. It's on the currency. JEFFREY TOOBIN, CNN Legal Analyst: It's on the currency, and they say because it's on the currency, there's nothing wrong with it being in the schools, or in the courthouses, or in the Capitol. AMANPOUR: But they also play the victim somewhat. ABRAMS: This series was well-produced and successful, but also shameful advocacy masked as journalism. We have opinionated hosts here on MSNBC who offer opinions on a wide range of topics, including me, but I admit it when I'm advocating. In the end, this was exactly what she said it wasn't: lobbying, advocacy, and an effort, intentional or not, to have people draw particular conclusions. Before we talk about some of this other stuff, Asma, what do you think about the comments that I just made? ABRAMS: A little history lesson for you. I covered the Oklahoma City bombing trial, and you talk to any of the prosecutors who prosecuted the case. In the end, they don't believe that it was part of some militia effort. So that's just fiction, and that's the problem here. The facts are so important. HASAN: But didn't Timothy McVeigh say in writings from prison that he didn't like how the government was treating Christians, how they were restricting Christians? ABRAMS: Yeah, he didn't. He didn't. That's right. That's right. That's the beauty of this. Steve Emerson, the beauty of this is they highlight throughout the CNN piece, they highlight identifiable people, Christians and Jews, who've been arrested and convicted of various crimes. And they lump it in, and they claim this is all one big religious fundamentalism. STEVE EMERSON, Terrorism Analyst: Right. It's so contrived, I thought that I was watching Al-Jazeera. The treatment of radical Islamic fundamentalists were given kid-glove treatment. They explain the Muslim Brotherhood as a peaceful movement. They explain jihad as a peaceful internal struggle. I mean, this was inverting reality on its head. And when they described terrorism, they could only explain it in terms of Muslims being the victims, not being the perpetrators. I felt that, I was really, I felt that the viewer here was really dishonestly treated here. And as far as the treatment of Jews and Christians, when Christian lawyers went to law school, they were called, demonized as "God's warriors." And when Jewish supporters of Israel lobbied for Israel, they were demonized as somehow causing riots throughout the Middle East. This was the most unfair series and, I think, the most dishonest series on television that I've seen in my 20 years of reporting or covering terrorism. ABRAMS: Reverend Gaddy, let me ask you this. Let me play this piece of sound for you where, again, Christiane Amanpour compares some of the fundamentalist Christians to the Taliban. And I want to ask you if you think this is a fair comparison. AMANPOUR: On campus, students must follow a strict set of rules. When I, you know, read that women have to wear skirts of a certain length and guys aren't allowed to, you know, go on the Internet unsupervised, I mean, I think, you know, totalitarian regimes. RON LUCE, Christian youth leader: No, it's about learning to have disciplines that communicate purity, you know. The skirts' length are to keep guys from, you know, any man on the planet could be distracted, and we don't want to unintentionally create distraction. 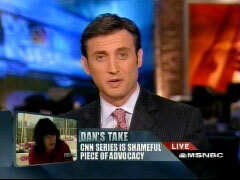 AMANPOUR: But, Ron, that's what the Taliban said. They kept women in their house because men couldn't be trusted around them. ABRAMS: Fair comparison, Reverend Gaddy, between a dress code and the Taliban? ABRAMS: And they back it up, again, we're not just talking about individuals who we can name, but there is a large and significant movement of fundamentalist Islam, which I think ends up being minimized by equating this all. I'm sorry, Asma, I interrupted you before. ABRAMS: Okay, but that's fine. That's fine. But that doesn't address, look, I'm not going to have debates about the settlements here. I'm debating the bias, the overt bias of this CNN series. ABRAMS: Steve Emerson, I want to play you this piece of sound. It's a final one. ... And this is again suggesting, let's listen, and then we'll talk about it. AMANPOUR: Across Europe, Islam is the fastest growing religion, the number of Muslims tripling in the last 30 years. This increased Muslim presence and violence like the Van Gogh murder play into the hands of right-wing politicians, like Geert Wilders, a member of the Dutch parliament. ABRAMS: All right, Steve Emerson, again, "play into the hands," the Muslims as the victims, again, throughout this whole piece. EMERSON: Exactly. She didn't mention the Madrid bombings, she didn't mention the two London series of bombings, she didn't mention the number of attacks in Europe, throughout Europe. She didn't mention the vast amount of Wahabist radical Islamic influence and supporters in the United States. She omitted all of that in an attempt to bring the perpetrators who she claimed were right-wingers or Christians or Jews. I thought that, in part, the actual dogma of this series actually focused mainly on Jews and Christians as being the demons, and in fact, one could accuse her of actually engaging in anti-Christian and anti-Semitic behavior by the selection of facts she chose to choose. ABRAMS: Reverend Gaddy, go ahead. ABRAMS: Well, I can tell you this, CNN is listening to this segment, so maybe they will hear you loud and clear on that and make up for what I think was really well done but ultimately shoddy journalism.